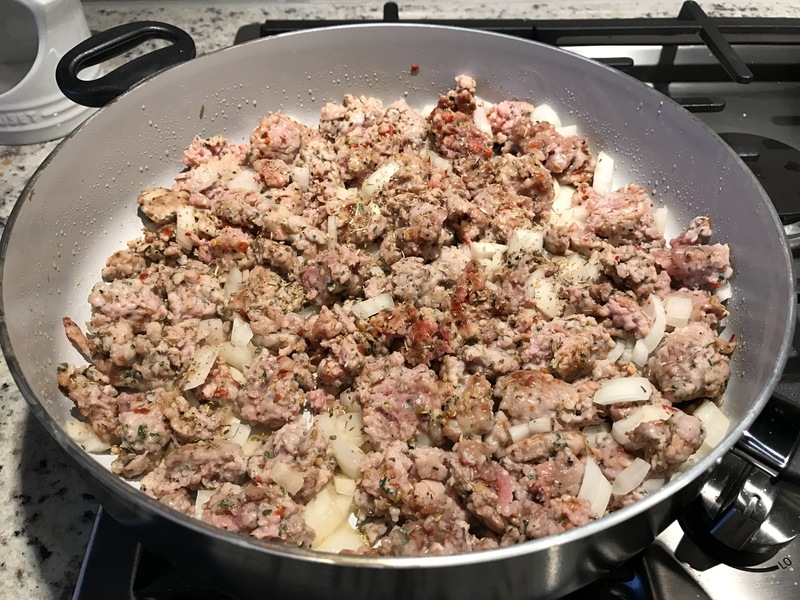 If you haven’t noticed a theme on the blog… I am kind of obsessed with Italian Sausage. It has become the easy star of so many recipes. It is just so easy to keep on hand, it freezes so well! 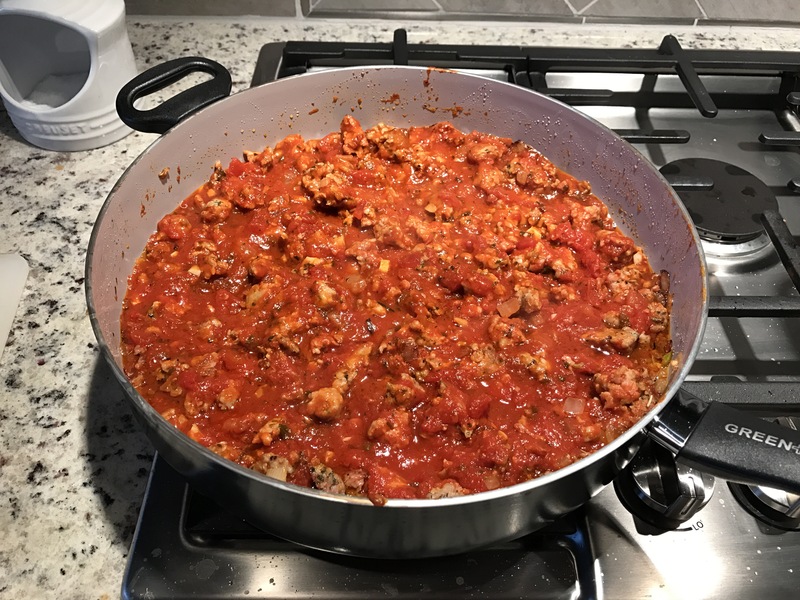 And I’m not just talking about the pork version… I am in love with any chicken or turkey Italian sausage. Sprouts has a fabulous option that really cuts calories out of any of these recipes… Italian Sausage and Gnocchi Soup, Farro and Sausage Parmigiano, Lasagna. 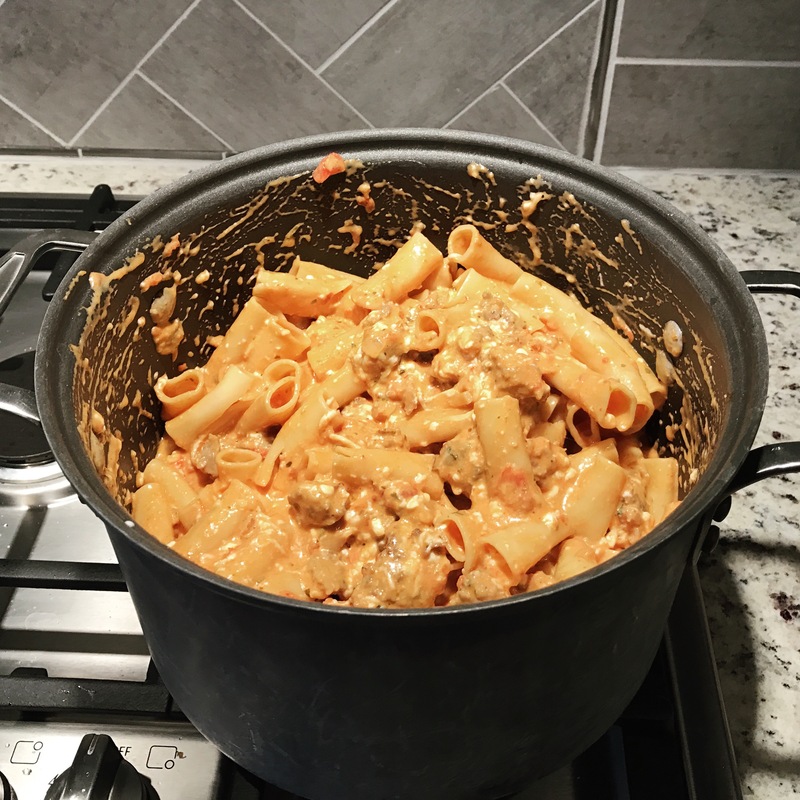 This recipe is not what I would consider “healthy” but for a pasta dish you can make some substitutions to cut down on calories. Its probably about 600 calories per serving as made below, so it’s not the worst as far as pasta goes. 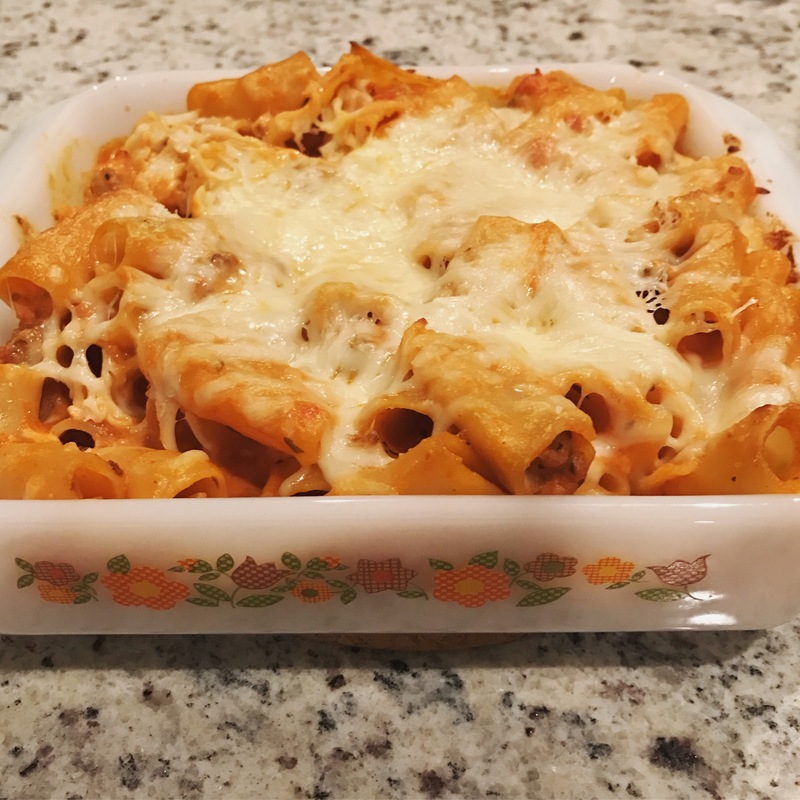 If you make all of this ziti at once, it will serve quite a large crowd. You should definitely serve it with a salad and some crusty bread. I would do a simple salad with spring mix, balsamic vinaigrette, capers, mozzarella. If you bake half and freeze half, you will still have a fair amount of leftovers for lunch the next day. 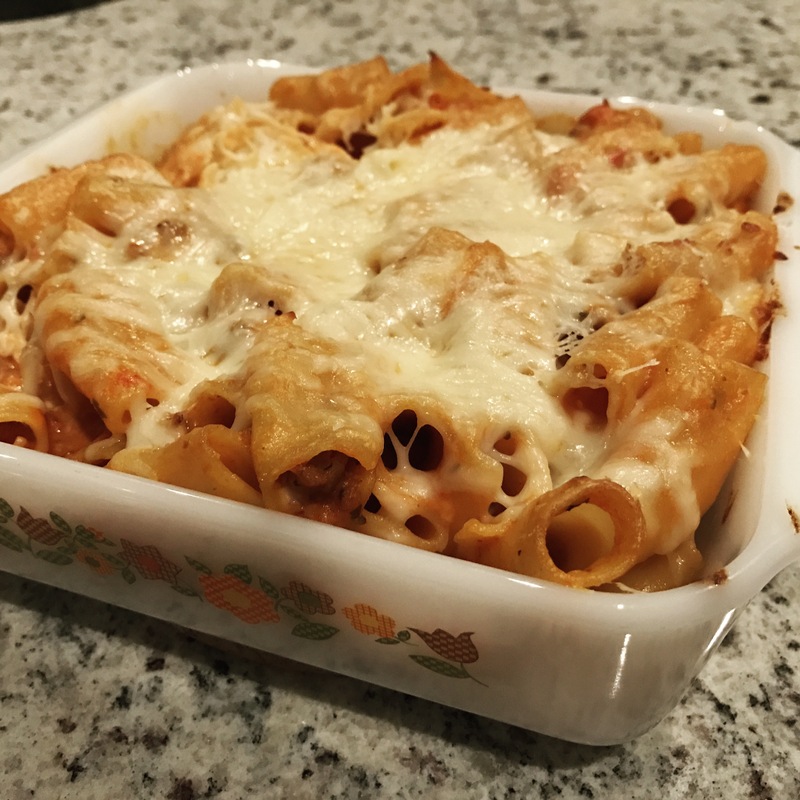 As far as wine goes I think that pinot noir and merlot are excellent choices for this baked ziti. If you’re looking for a bargain wine, step 1 go to Costco… and then give A to Z Oregon Pinot Noir a try. It is a great value at around $15. It will give you all the great qualities of Oregon Pinot at a fraction of the price. These Oregon Pinots are not the jammy, mouth puckering wines like you might find in Napa. They are more rich and have a woody characteristic. A to Z makes a pinot that is fabulous with this ziti but is also easy to drink on its own. A bottle of this will disappear in minutes when drinking with friends on the porch on a cool spring evening. Preheat oven to 350 degrees. Whisk together the cottage cheese, eggs, 1 cup of freshly grated parmesan cheese in a medium bowl. Boil a large pot of salted water. Cook the pasta until it softens but is not fully cooked. Drain and set aside. Heat olive oil over medium heat. Saute the onion until soft for about 7 minutes. Add in the turkey sausage, breaking it up. Cook until nearly all browned. Add in the garlic and oregano and cook for two minutes more. Pour in the tomato sauce and sugar and stir until combined. Simmer over medium low until thickened, about 12 minutes. Season to taste with salt and pepper. 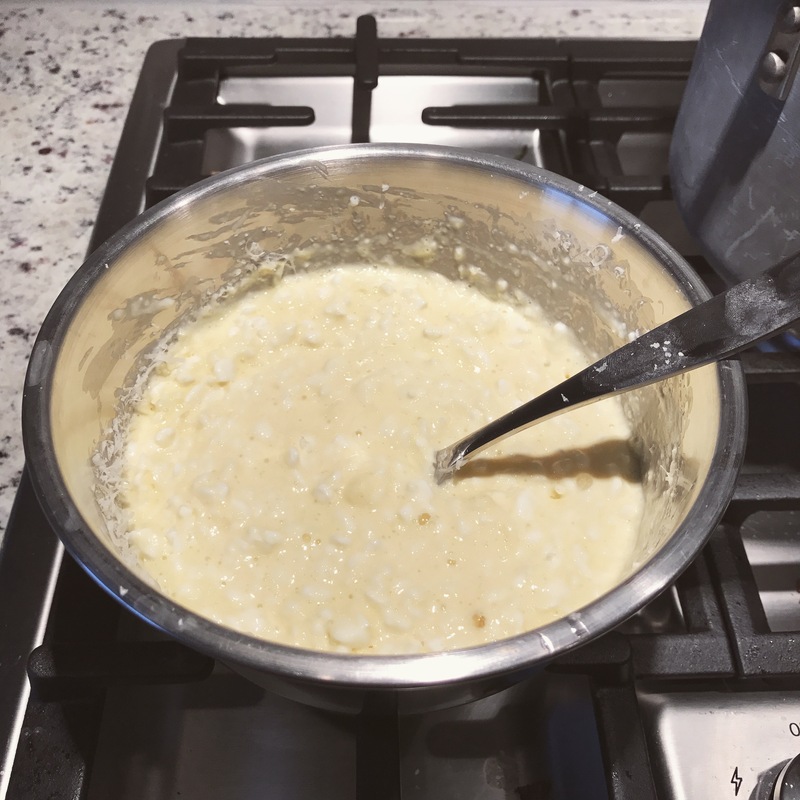 Mix together the cornstarch and heavy cream in a small bowl. Pour this into the stockpot you cooked your pasta in. Bring to a simmer over medium heat and cook until thickened, 5 minutes. Turn off the heat. Stir in the cottage cheese mixture, tomato sauce, and about 2/3 of the mozzarella cheese. Mix well until combined. Add the pasta and toss to coat. Transfer this to a 9×13 baking dish. Sprinkle with the remaining mozzarella and parmesan cheeses. (This would be the last step before freezing.) Cover the dish tightly with foil and bake for 30 minutes. Remove the foil and continue to cook until bubbling, about 20 minutes longer. Allow the pasta to cool for 10 minutes prior to serving.